Last month I took my spring and summer clothes out of storage. After a long and cold winter, I’m grateful to finally be able to wear my dresses, tees and tank tops. However, wearing my spring wardrobe requires a little bit of effort on my part. I need to get rid of the extra body hair. I can’t hide it in a big sweater or pair of sweat pants. Normally, I shave my underarms daily and I alternate between shaving and waxing my legs. I go to the salon every 6 weeks or so to have my eyebrows waxed. I’ve only ever shaved my underarms. I’m not brave enough to get them waxed because I’ve been told how painful it is. 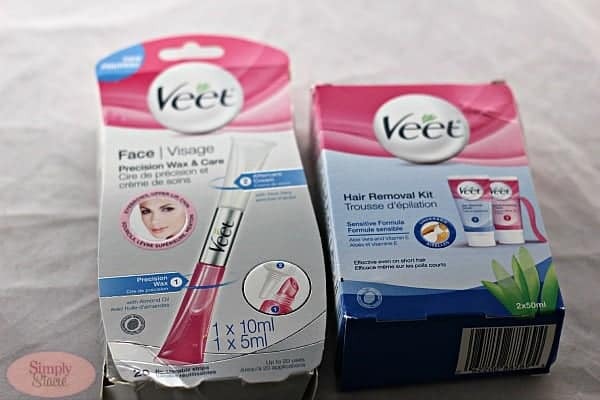 When I found out about Veet Underarm Hair Removal Kit, I was very interested in trying it out. I’ve used Veet in the past so I’m familiar with how depilatory cream works. Veet’s Hair Removal Kit for Underarms works to dissolve the hair and it will work on hair that’s as short as .3mm. It’s also made for sensitive skin and is enriched with Aloe Vera and Vitamin E. It’s said to remove your hair in about 5 minutes and will last up to two times longer than shaving. After letting my hair grow for a couple days, I decided I was ready to give Veet a try. The pack contains a Hair Removal Cream, Application Spatula and Gentle Finishing Cream. I applied about a dime sized amount to my armpit and then spread it over the hair as evenly as I could using the curved end of the spatula. Then it says to leave the cream sit for 5 minutes. I didn’t have to walk around with my arms in the air and was able to continue on with my housecleaning. After 5 minutes, I checked to see if it was ready to come off by using the spatula over a small area. My hair was stubborn and decided it wasn’t ready to come off so as the package directed, I left it on another 5 minutes. It says on the package not to exceed 10 minutes so either way at the 10 minute mark, it was coming off. At 10 minutes, I checked again and the hair came off easily with the spatula. After rinsing the area with warm water to make sure all the cream and stray hairs were gone, I then dried it and applied the Gentle Finishing Cream. I was surprised by a couple things. First of all, it did have a smell, but it wasn’t as strong as I thought it would be. When I’ve done my bikini area in the past and used other depilatory creams I remember how bad the smell was. However, this product was fine and the smell though not pleasant, was not that bad compared to others I’ve tried. Also, there was no redness or irritation. I have extremely sensitive skin and was happy to see that my skin was totally normal afterwards. I also like that I don’t have to shave that area daily. It keeps my hair regrowth at bay for a couple days longer than regular shaving does. The MSRP is $8.49 and the kit will last me awhile. I also received Veet Precision Wax & Care which is designed to easily and effectively remove facial hair for up to 28 days. You can use it on your eyebrows, upper lip, chin and cheeks. It comes with the Precision Wax, Aftercare Cream, Precision Spatula and 20 Reusable fabric strips and has an MSRP of $16.99. I’m extremely nearsighted and can only see my face if I stand with my nose right up on the mirror. Even then its a struggle so I can’t do my own eyebrows. I never could and have to go to the salon and have them done for me. I’ve never needed to wax the other areas on my face so I wasn’t able to try out this product. However, I wanted to share it with my readers in case you are in need of some TLC in that area! I’m giving the Veet Precision Wax & Care to my sister to try. I will have to give this a try! I, like most, want smooth hair free underarms but hate shaving. I swim a lot so shaving is a must. I’ve always been worried about products burninc, not working, or leaving bumps behind which would be unsightly too. Good to know you found a winner and great timing with warmer weather…hopefully…just around the corner. I have used Veet for my legs, but I didn’t know they had underarm hair removal. I will have to give it a try since warmer weather is coming. Thank you. I will have to give this a try, I didn’t even know that Veet had underarm hair removal. I always just shave but it would be good to get a closer shave so I have to try this product. I need to try this because I had a bad reaction to nair last time I tried to use it.